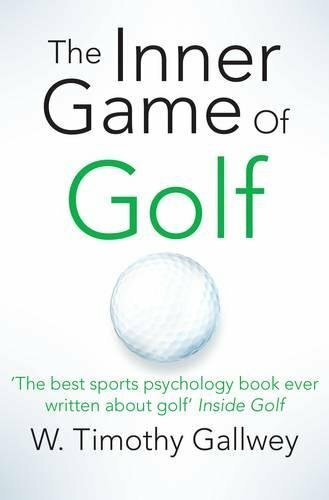 I don’t play golf, but I recently read W Timothy Gallwey‘s The Inner Game of Golf (1981). A few years ago, I read his classic The Inner Game of Tennis (1974), a favorite among top coaches including Steve Kerr and Pete Carroll. 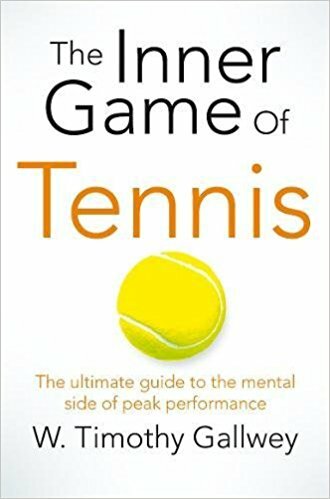 I don’t play tennis either, but I’m interested in Gallwey’s theories on learning and peak performance. Eventually, during an unsettled period in his early 30s, he found himself working as a tennis pro in Seaside, California. At first he taught in the way that he had been taught: Look at the student’s stroke, compare it to textbook form, correct the student until his strokes become more like the “proper” way to hit the ball. One day, out of boredom, he began simply tossing balls. Before he could issue instructions, the student’s strokes began to improve. He realized that the student was learning on his own. Gallwey discovered that verbal instructions were best kept to a minimum. If not, students would end up self-judging their actions instead of paying attention to the ball. He found that his teaching often got in the way of students’ learning. The students’ strokes were overly tight and controlled, since they were concerned with failure and negative judgment. He found it more effective to demonstrate a stroke several times—and then to let students try it. To guide them, he would avoid directive instructions and, instead, draw their attention to the relevant action. For example, instead of telling them exactly how far to rotate the torso in a backhand, he might say, “How far is your torso rotating to the side before you swing?” By simply paying attention to the body part, the students somehow self-corrected themselves. All tension should be released from the right leg and hip. The right knee should break in toward the left knee. The wrists uncock, the right arm straightens and then turns over going forward over the left shoulder. This all takes place in that sequence and you will find that it will bring you to the complete finish. Even non-golfers can see that such instructions are too complex and wordy—difficult to follow even in slow motion, much less in the dynamic rhythm and tempo of a golf swing. Also, instructions, especially if given by an expert, signify correctness and authority, which Gallwey finds counterproductive and likely to increase performance anxiety. Gallwey hypothesizes that it’s impossible verbally to describe complicated physical instructions. For example, describe in words how to tie your shoelaces or to handwrite your name. It’s clearer to show by example, physically. Same, he thinks, with sports and other physical movements. Communication gap Do the words make sense to the student? In golf, it’s apparently common to say “pronate the wrists,” and most beginners have no clue what it means. Gap between intellectual and visceral understanding Even if the student intellectually understands what to do, he might lack the kinesthetic awareness to do it. Gap between current level and potential level As above, even if the student intellectually understands an instruction, he might currently lack the experience to do it. In other words, the skill might be too advanced for his current stage. Correctness gap The instructions might be incorrect. Gallwey does acknowledge that “doable do instructions” can be helpful if they are given sparingly. But if there are too many instructions, even simple ones, the student’s mind gets clogged with rules. Often the student already knows that his head should be still. Despite best efforts, however, he can’t help but move. Is the student “in his body” enough to know what he’s doing? If not, how can he possibly control his movement? 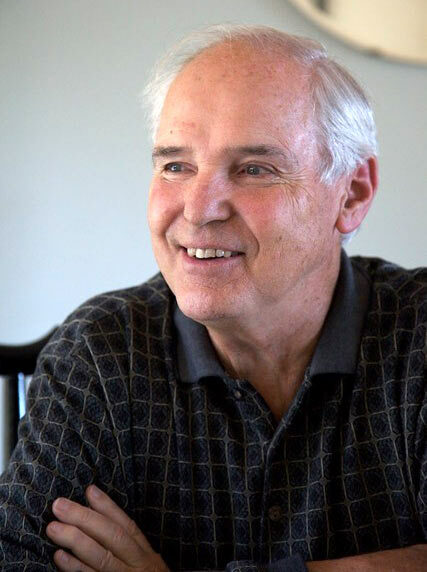 Learning comes not from specific instructions, Gallwey believes, but from “relaxed concentration.” Concentration is not a novel concept: Whether in working, studying, driving, conversing, or playing sports, we’re expected to focus, to pay attention, to watch the ball. But the key word is “relaxed.” If we try too hard, we are tight, forced, and disconnected from our minds and bodies. Gallwey distinguishes between two “selves” or voices within most people. Self 1 is like the left brain: analytical, verbal, judgmental. Self 2 is like the right brain: intuitive, visual/auditory, non-judgmental. (Note: He doesn’t refer to left versus right brain concepts and considers only Self 2 to be the true self.) Only by silencing the controlling, critical chatter of Self 1, he believes, can we be self aware, self motivated, and self trusting—to perform at our best. Can relaxed concentration be taught? Gallwey doesn’t think so, but it can be developed with practice. 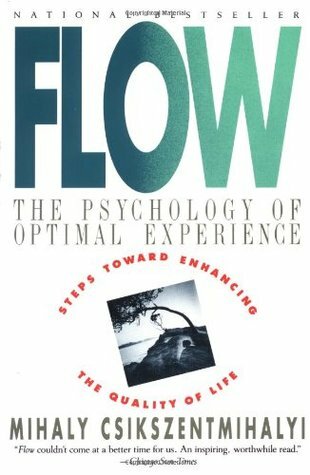 I found parallels between Gallwey’s relaxed concentration and the psychological concept of flow, set forth by Mihaly Csikszentmihalyi in his seminal work, Flow: The Psychology of Optimal Experience (1990), when he was a professor at the University of Chicago. Flow is a mental state of total absorption, of being “in the zone,” oblivious to time and space. To me, relaxed concentration is the first stage of flow. I was intrigued by Gallwey’s ideas, partly due to their parallels to Zen philosophy—but also because verbal instructions are integral to Iyengar yoga teaching. As a student, I find them useful: The anatomical specificity refines my form and fixes my attention on the immediate task. I also appreciate a well-turned phrase, which can make an idea come alive and stick in my mind. That said, I have also been overwhelmed by a barrage of instructions and no opportunity to explore a pose from within. Are verbal instructions overused? Am I encouraging enough inner learning—not only in my students, but also in myself? Form Iyengar yoga is about form itself, not about another objective such as hitting a ball. While unusual form in sports might be fine if the end result is positive (an ace, a goal, a faster time), in Iyengar yoga, form is critical. Pace In contrast to sports movements, yoga is performed relatively slowly and deliberately. There actually is time to perform specific instructions. Physical versus mental limits Minimalist, mental-game teaching is geared for students who are fairly adept. If someone can play a decent game of tennis, then I’d agree that the prime causes of error involve the player’s mind (doubt, tension, concentration lapses) more than physical limits or ignorance on mechanics. In Iyengar yoga, however, many poses are physically inaccessible to students. They might understand the actions but be unable to perform them, not now, maybe never. Multifaceted teaching approach While Iyengar yoga teaching is full of verbal instructions, teachers also demonstrate with their bodies and give individualized corrections. Therefore, if words are unclear, a visual demo might clarify them—and an individualized manual or physical adjustment can ensure understanding. If you can do Vrksasana for one minute, why might you topple after two minutes? Four minutes? While long balancings do require strength and stamina, they also require Gallwey’s relaxed concentration. How can one stay focused and yet relaxed? When Gallwey taught tennis, he discovered the “Bounce Hit” technique: Say to yourself “bounce” the moment the ball lands on the court and “hit” the moment you hit it with your racket. He also suggested eying not merely the tennis ball, but the lines on the ball. Both of these exercises engross your attention more than simply hitting the ball—so that Self 1 has no chance to insert instructions and criticisms. Beginners who could barely rally suddenly could hit the ball more consistently—since they were focusing on the immediate (ball and body), with no opportunity to get nervous about missing. A focusing exercise must be engaging enough to hold one’s attention, to distract it from habitual mental chatter. It must also give useful feedback (here, regarding the body and the ball) to enable better performance. In Vrksasana, I sometimes employ similar techniques. For example, instead of silently verbalizing instructions to myself, I observe my pelvis: Is it symmetrically aligned? Is it stable? Other times, I scrutinize whatever is in my “gaze spot”—as if I must accurately sketch it later. I find that this visual focus relaxes me. I also might silently think of a song, an auditory “distraction” that actually frees my mind from overthinking the pose. In poses such as Adho Mukha Vrksasana, the dynamic entry is akin to a sports movement. While the set-up is important, the kick-up happens in an instant. It must be done with a bit of abandon! Those who overthink the right actions can end up too tense and contrived. Especially when first attempting to do a handstand, looser, less perfect form is more conducive to getting up. Let the body, not the mind, do the pose. Another such pose is Ardha Baddha Padmottanasana, a one-legged standing balance pose in which the exit, rather than the entry, can be tricky. I teach my students what helps me rise from the forward bend: I establish a mid-level gaze spot for my eyes to find as I rise. 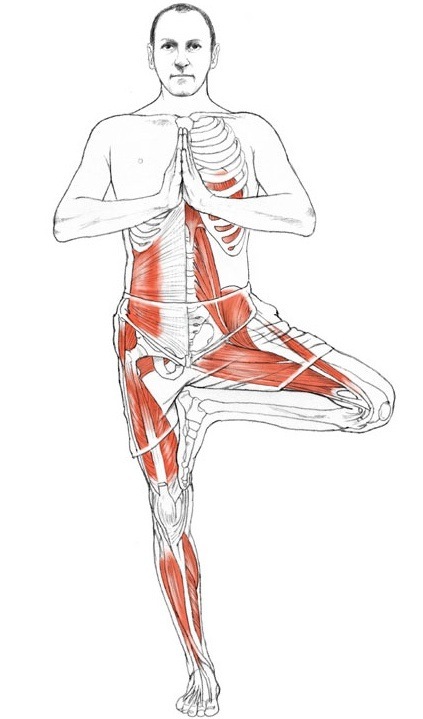 I press my Padmasana foot into my standing leg to keep my hips even. In addition, I employ this Gallwey idea: Associate an easy, almost infallible task with a seemingly difficult or inconsistent one. In golf, for example, if hitting a 10-foot putt you might imagine that you’re simply picking up a ball from the hole. 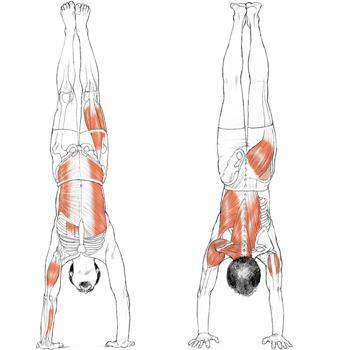 For Ardha Baddha Padmottanasana, I imagine that I’m exiting easy, familiar Uttanasana. Throughout the ages there have always been two streams of advice for people who wanted to improve a skill. I call one the river of “formulas” and the other the river of “feel.” One current flows toward mastery in the outer world, the other toward mastery in the inner. Because Iyengar yoga instructions are specific, rigorous, and liberally used, they might seem like formulas. But they are actually a means of entry, a threshold. Verbal instructions are an effective road map, to set you in the right direction. Once along the way, the next step is independent exploration, learning by feel. Let’s not stop short of this inner journey. Many thanks for sharing your interesting and relevant comment, Tom. Made my day to know that this post resonated with you! I think some people do become discouraged by endless instructions when they begin to do yoga. Like me! It seemed impossibly complicated. Some people, however, forge ahead without getting proper form and become injured (somehow, also me) so a balance is definitely required. I will think about this post when I practice. Thank you. It is a fine balance and ultimately a question of teaching versus learning. Instructions can be perfect, but are they facilitating learning? Or are other means more appropriate? And it varies by person, by time and place, etc. Thanks for commenting! Your observations and reflections prompted me to revisit a similar, but more profound, “classic” that’s been resting on my bookshelf for decades: ZEN IN THE ART OF ARCHERY, by Eugen Herrigel (1953). Previous Previous post: No offense!